Before :- U.L. Bhat, K.T. Thomas and P.K. Shamusuddin, JJ. Criminal M.C. No. 904 of 1985. D/d. 17.11.1986. For the Petitioner :- Kallada Sukumaran and K. Vijauamma, Advocates. For the Respondents :- M.N. Sukumaran Nayar, B. Raman Pillai, Advocates and Public Prosecutor. Thankamma v. Appukuttan Nair, AIR 1975 Kerala LT 131. Raghavan Unnithan v. Vijayamma, 1962 Ker. L.T. 526. Sumathi v. Peter, 1985 Ker. LT 1179. Bai Tahira v. Ali Hussain Fissali, AIR 1979 SC 362. Jagir Kaur v. Jaswant Singh, AIR 1963 SC 152. Ramesh Chander v. Veena Kaushal, AIR 1978 SC 1807. Nand Lal v. Kanhaiya Lal, AIR 1960 SC 882. Ram Ratam v. Smt. Meema, ILR 1964(14) Raj. 379. Bodh Raj v. State, 1983 All. LJ 216. In re Vithaldas Bhurabhai, AIR 1928 Bom. 346. A.W. Khan v. Zainabbi, AIR 1950 Nagpur 45. Seri Ram Reddy v. Chandramma, AIR 1952 Hyd. 45. Nagendramma v. Ramakotayya, AIR 1954 Madras 713. Karnail Singh v. Mst. Bachan Kaur, AIR 1955 Punjab 26. Jaswantsinghji v. Kesuba Harisinh, AIR 1955 Bom. 108. T.K. Thayumanuyar v. Asanambar Ammal, AIR 1958 Mys. 190. Sew Kumher v. Mongru Kumharin, AIR 1959 Cal. 454. C.A. George v. Chacko Joseph, 1953 Ker. LJ 542. Gurnam Singh v. Mr. Ditto, AIR 1950 East Punjab 20. Revappa v. Gurusanthawwa, AIR 1960 Mys. 198. Thulasingam v. Padmavathi Ammal, 1963(1) Cri. L. 546 (Madras). Hamendra Nath Chowdhury v. Smt. Archana Chowdhury, AIR 1971 Cal. 244. Laxmandas v. Smt. Lachamibai, 1968(9) Guj. LR 116. Dhani Ram v. State, 1974 Cri. LJ 1234. Chathu v. Gopalan, 1981 Ker. LT 103. U.L. Bhat, J. - Petitioner is the husband of the first respondent and father of the second respondent. Respondents herein filed M.C. 37/1983 under Section 125 of the Criminal P.C. (for short the Code) before the Judicial Magistrate of the I Class, Kayamuklam claiming maintenance at the rates of Rs. 300/- and Rs. 200/- per month respectively from the petitioner on the ground that they have no means to maintain themselves and petitioner, though he has means, has neglected to maintain them. Learned Magistrate set the petitioner ex parte and on the basis of the evidence of the first respondent, examined as P.W.1, ordered the petitioner to pay maintenance at the rates claimed from 2.7.1983 onwards. 2. Petitioner herein challenged the order by way of R.P. 30/1984 before the Sessions Court, Alleppey. Since the revision petition was filed belatedly, an application was filed for condonation of delay and the same was allowed. However, learned Sessions Judge dismissed the revision petition on the ground that no illegality or impropriety in the order of the learned Magistrate has been made out. This order is challenged in the present Crl. M.C. "The question that arises for consideration in this petition, filed under Section 482 of the Cr.P.C. is whether the trial Magistrate can dispose of a petition under Section 125 of the Code without specifically entering into a finding that the respondent before him is wilfully avoiding service of notice or wilfully neglecting to attend the court after accepting summons. The consequence of order passed in violation of the said provision also arises for consideration. 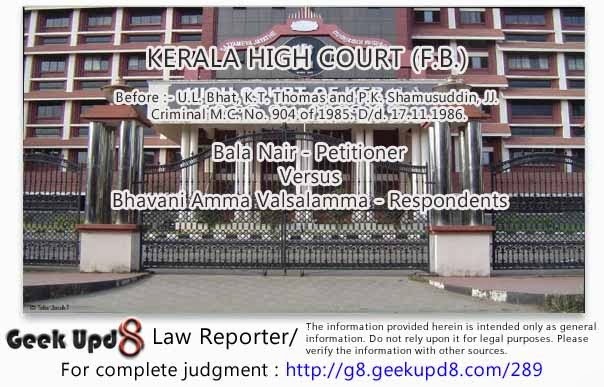 In Thankamma v. Appukuttan, AIR 1975 Kerala LT 131, a Division Bench of this Court took the view that it is not the issue of summons, that confers jurisdiction on courts over persons and that unless the order passed by the Magistrate ex parte is set aside the said decision is valid and binding. That decision specifically overruled the decision in Raghavan Unnithan v. Vijayamma, 1962 Ker. L.T. 526. In Sumathi v. Peter, 1985 Ker. LT 1179, one learned Single Judge, relying on 1962 Ker LT 526 took the view that the bar of 3 months will not apply in the case of an ex parte order passed without complying with the provisions of the proviso. There appears to be an appearnt conflict between the said two decisions." "The main question that comes up for consideration is whether a respondent against whom an ex parte order has been passed under the proviso to sub-section (2) of Section 126 of the Code could file only a restoration petition and that too only within a period of three months from the date of the order. A Division Bench decision in Thankamma v. Appukuttan (supra) holds the view that once the ex parte decision is not set aside by a proceeding as contemplated under the proviso on the basis of a petition filed within three months from the date of the order, the ex parte order will stand. The matter came up before us on the basis of a reference by the single Judge before whom the matter came. We are of opinion that for a proper decision of the case, it is necessary to reconsider the decision in Thankamma's case (supra)." 5. We have heard learned Counsel for the petitioner, learned Counsel for respondents 1 and 2 and the learned Public Prosecutor. (1) Whether in order to determine maintenance claimed under Section 125 of the Code ex parte. A Magistrate should specifically record that he is satisfied that the person against whom an order is proposed to be made is wilfully avoiding service or wilfully neglecting to attend Court, and, if so, whether reasons for satisfaction should also be specifically recorded ? What is the consequence of not doing so ? (2) Whether service in regard to the proceedings under Chapter IX of the Code has to be effected in terms of Chapter VI of the Code ? If so, whether an order can be passed ex parte without attempting service in terms of Chapter VI ? (3) Whether service by registered post or through Indian Embassy would be adequate service for the purpose of Chapter IX ? (4) Whether a person against whom an ex parte order has been passed under the proviso to Section 126(2) of the Code has no remedy other than filing a petition before the Magistrate concerned to set aside the ex parte order ? (5) Whether in the facts and circumstances of the case this Court should interfere under Section 482 of the Cr.P.C. ? 7. Chapter IX of the Code deals with order for maintenance of wives, children and parents. Section 125 is the substantive provision by virtue of which a Magistrate may pass an order for payment of maintenance against a person having sufficient means but who neglects or refuses to maintain his wife, unable to maintain herself, or his legitimate or illegitimate minor child, whether married or not, unable to maintain itself or his legitimate or illegitimate child (not being a married daughter) who has attained majority, where such child is, by reason of any physical or mental abnormality or injury unable to maintain itself, or his father or mother, unable to maintain himself or herself, upon proof of such neglect or refusal. Sub-section (3) of Section 125 deals with enforcement of an order. If a person so ordered fails without sufficient cause to comply with the order, a Magistrate may, for every breach of the order, issue a warrant for levying the amount due in the manner provided for levying fines, and may sentence such person for the whole or any part of each month's allowance remaining unpaid after the execution of the warrant to imprisonment for a term which may extend to one month or until payment if sooner made. It is not relevant to refer to the two provisos to the sub-section. Section 126 deals with procedure to be followed in regard to proceedings under Section 125. Section 127 deals with alteration of allowance once ordered by a Magistrate. Section 128 provides inter alia, that the order could be enforced by any Magistrate in any place where the person against whom it is made may be. (c) where he last resided with wife, or as the case may be, with the mother of the illegitimate child. Provided that if the Magistrate is satisfied that the person against whom an order for payment of maintenance is proposed to be made is wilfully avoiding service, or wilfully neglecting to attend the Court, the Magistrate may proceed to hear and determine the case ex parte and any order so made may be set aside for good cause shown on an application made within three months from the date thereof subject to such terms including terms as to payment of costs to the opposite party as the Magistrate may think just and proper. (3) The Court in dealing with applications under Section 125 shall have power to make such order as to costs as may be just." 9. We are immediately concerned with sub-section (2). All evidence in the proceedings shall be taken in the presence of the person against whom an order for payment of maintenance is proposed to be made or when his personal attendance is dispensed with, in the presence of his pleader, and shall be recorded in the manner prescribed for summons-cases. The proviso lays down an exception to sub-section (2). If the Magistrate is satisfied that the opposite party is wilfully avoiding service or wilfully neglecting to attend the Court, he may proceed to hear and determine the case ex parte. Any order so made may be set aside for good cause on an application made within three months from the date of the order subject to such terms including terms as to pay of costs as the Magistrate may think just and proper. Normally, evidence has to be recorded in the presence of the opposite party or, when his personal attendance is dispensed with, in the presence of his pleader. 10. Though Section 125 benefits a distressed father also, main thrust of the provision is to assist women and children in distress. That is fully consistent with Article 15(3) of the Constitution which states that the prohibition contained in the Article shall not prevent the State from making any special provision for women and children. We take note of Article 39 of the Constitution which states, inter alia, that the State shall, in particular, direct its policy towards securing that the citizens, men and women equally, have the right to an adequate means to livelihood, that children are given opportunities and facilities to develop in a healthy manner and in conditions of freedom and dignity and that childhood and youth are protected against exploitation and against moral and material abandonment. See Bai Tahira v. Ali Hussain Fissali, AIR 1979 SC 362 and Jagir Kaur v. Jaswant Singh, AIR 1963 SC 152. The provision is a measure of social justice and specially enacted to protest women and children. As the Supreme Court observe in Ramesh Chander v. Veena Kaushal, AIR 1978 SC 1807 the brooding presence of constitution empathy for the weaker sections like women and children must inform interpretation if it has to have social relevance. 11. A criminal Court in enquiry or trial against a person accused of commission of an offence cannot normally proceed in his absence. Section 226 of the Code dealing with trial before the Court of Sessions states that the Prosecutor shall open the case when the accused appears or is brought before the Court. Section 238 dealing with trial of warrant cases by a Magistrate contemplates the accused appearing or being brought before the Magistrate. So also, Section 251 dealing with trial of summons cases by Magistrates. But there is no such provision in Chapter IX of the Code dealing with claims for maintenance. 12. Requirements of sub-section (2), of Section 126 that evidence shall be recorded in the presence of the person against whom an order for payment of maintenance is proposed to be passed or, when his personal attendance is disposed with, in the presence of his pleader, is a provision incorporated not merely in the interest of such party. As observed by the Supreme Court in Nand Lal v. Kanhaiya Lal, AIR 1960 SC 882, notice to such person is in the interests of both the applicant as well as the opposite party. It enables the opposite party or respondent to be present when evidence is taken against him, so that principles of natural justice are satisfied and he is enabled to put forth appropriate defences. It also lightens the burden of the claimant for an honest person may admit the marriage or his paternity of the children if this was the fact, and may contest only on really disputed matters. Nevertheless, blind insistence on the presence of the opposite party or his pleader when evidence is taken is susceptible of vast abuses and manipulations; for, that would place it within the power of the opposite party to see that evidence is indefinitely postponed or is never taken, by his own voluntary or deliberate absence before Court. It is to avoid such contingencies that the Legislature has empowered the Magistrate to determine the case ex parte where he is satisfied that the opposite party is wilfully avoiding service or wilfully neglecting to attend the Court. It is the Magistrate's satisfaction which is of importance. 13. Before proceeding to hear and determine the case ex parte, the Magistrate has to apply his mind to the question whether the opposite party is wilfully avoiding service or wilfully neglecting to attend Court and be satisfied that there has been such wilful conduct on the part of the opposite party. The Magistrate cannot proceed ex parte without arriving at such satisfaction. It is desirable for Magistrate to pass a formal order recording such satisfaction and giving reasons for such satisfaction. However, the condition precedent for proceeding ex parte is the satisfaction based on reasons and not the formal order. The satisfaction must be discernible from the record. There is a conflict of opinion among various High Courts on the need for a formal order. We think that the more informed view is that a formal order is desirable, but the absence of a formal order would not vitiate the order or the proceedings, so long as the record evidences circumstances which show the existence of reasons to satisfy the Magistrate on this score and which imply such satisfaction. We are in agreement with the view taken by the Rajasthan High Court in this behalf in Ram Ratam v. Smt. Meema, ILR 1964(14) Raj. 379 and the Allahabad High Court in Bodh Raj v. State, 1963 All. LJ 216. 14. Proviso to sub-section (2) of Section 126 refers to satisfaction of the Magistrate that the opposite party is wilfully avoiding service or wilfully neglecting to attend the Court. The expression "service" is not defined in the Chapter or the Code. It is not stated that what has to be served is summons" in the general sense of the word or summons as contemplated in the Code or a mere notice. Learned Counsel for the petitioner contends that what has to be served is summons or process as contemplated in Chapter VI of the Code. We have been referred to a large number of decisions of various Courts. We do not think it necessary to refer to these decisions since the question has not been considered in those cases and the decisions proceed on the assumption that what is required is summons under Chapter VI of the Code. Our attention has not been invited to any decision where this question has been specifically considered. 15. It is necessary to understand the nature of the proceedings before we decide this question. No doubt, provisions relating to maintenance occur in the Cr.P.C. and not in the Civil P.C. Nevertheless, the proceedings are and the relief given is essentially of a civil nature. Chap. IX prescribes a summary procedure for compelling a person to maintain his wife or children or parents. Findings of the Magistrate are not final or conclusive in the sense that they may in appropriate cases be open to scrutiny by a civil court. See Nand Lal's case AIR 1960 SC 882 : 1960 Crl. LJ 1246. The case does not deal with an offence. The person against whom the claim is made is not an offender or an accused. The order passed against him does not fell out a finding that he has committed an offence. There is no punishment imposed on him, though as a mode of recovery, imprisonment is provided for. He is not charged for the commission of a criminal offence. The object of the provision is not to punish him for the past neglect. The object is to prevent vagrancy and ameliorate distress. See In re Vithaldas Bhurabhai, AIR 1928 Bom. 346; Zainab Bibi v. Anwar Khan, AIR 1946 Pat 104; A.W. Khan v. Zainabbi, AIR 1950 Nagpur 45; Seri Ram Reddy v. Chandramma, AIR 1952 Hyd. 45; Nagendramma v. Ramakotayya, AIR 1954 Madras 713; Karnail Singh v. Mst. Bachan Kaur, AIR 1955 Punjab 26; Jaswantsinghji v. Kesuba Harisinh, AIR 1955 Bom. 108; T.K. Thayamanuyar v. Asanambar Ammal, AIR 1958 Mys. 190 and Sew Kumher v. Mongru Kumharain, AIR 1959 Cal. 454. 16. The relief given, as we have indicated, is essentially of a civil nature and the proceedings are essentially civil proceedings and not criminal proceedings. The proceedings have been described in some decisions as of a quasi-criminal nature or quasi-civil nature. But we are of opinion that they are essentially of a civil nature. The fact that the provisions occur in the Cr.P.C. and not the Civil P.C. and the fact that the recalcitrant opposite party who suffers the order of maintenance and does not obey the order may have to go to prison, will not change the nature of the proceedings from civil to criminal. The provisions have been incorporated in the Cr.P.C. only with a view to expedite the proceedings, as it was through that the Magistrate could better deal with the matter in a summary manner. Consistent with the principles of natural justice, the provisions contemplate evidence being recorded in the presence of both parties. Yet, it is not left to one party to ensure that evidence is recorded and case decided in the absence of the other. Naturally, when a claim is made, the opposite party must be informed about the claim and told that he has a right to appear in Court and put forward his own contentions and cross-examine the witness examined on behalf of the claimant and produce evidence himself. It can be said that Magistrate has to issue, what in essence and substance is notice to the opposite party. Notice may loosely be termed as summons also. But can it be said that process should consist of summons as contemplated in Chapter VI of the Code ? 17. The expression "summons" is not defined anywhere in the Code. Sections 61 to 68 dealing with summons occur in Part VI under the heading "process to compel appearance". Section 61 states that every summons issued by a Court under the Code shall be in writing, in duplicate, signed by the presiding officer of such Court or by such other designated officer and shall bear the seal of the Court. The form of summons to an accused person is prescribed as form No. 1 in second schedule to the Code. According to the model form, the summons should state "whereas your attendance is necessary to answer to a charge........ you are hereby required to appear in person (or by pleader, as the case may be) before............Herein fail not." 18. Section 62 onwards prescribes the method of serving summons. Section 62 states that every summons shall be served by a police officer, or subject to such rules in this behalf by an officer of the Court issuing it or other public servant. The summons shall if practicable be served personally on the person summoned, by delivering or tendering to him one of the duplicates of the summons. Every person on whom a summons is so served shall be required to sign a receipt therefor on the back of the other duplicate. Section 63 deals with service of summons on corporate bodies and societies. Summons could be so served by letter sent by registered post. Section 64 states that where the person summoned cannot, by the exercise of due diligence, be found (evidently in pursuance of Section 61), the summons may be served by leaving one of the duplicates for him with some adult male member of his family residing with him, and the person with whom the summons is so left shall, if so required, sign a receipt therefor on the back of the other duplicate Section 65 states that if service cannot by the exercise of due diligence be effected as provided in Sections 62 to 64, the serving officer shall affix one of the duplicates of the summons to some conspicuous part of the house or home, stead in which the person summoned ordinarily resides and thereupon, the Court, after making such inquires as it thinks fit, may either declare that the summons has been duly served or order fresh service in such manner as it considers proper. Section 66 deals with service on Government servant. Section 67 deals with service of summons outside local limits. When a Court desires that a summons issued by it shall be served at any place outside its local jurisdiction, it shall ordinarily send such summons in duplicate to the Magistrate within whose local jurisdiction the person summoned resides, or is to be there served. 19. Sections 70 to 81 deal with issue and enforcement of warrant of arrest. Section 82 to 86 deal with proclamation and attachment of property of a person against whom warrant has been issued and has absconded or has concealed himself, so that warrant cannot be executed. Section 87 prescribes that where the Court is empowered by the Code to issue summons for the appearance of any person, it may, after recording its reasons in writing issue a warrant for arrest, in lieu of, or in addition to, summons, where the conditions prescribed therein exist. According to Section 88, a person for whose appearance summons or warrant is to be issued is present in Court. He may be required to execute a bond with or without sureties for his appearance in Court and on breach of bond Section 79 empowers his arrest. Section 90 states that the provisions contained in the Chapter relating to summons an warrant, and their issue, service and execution, shall, so far as may be, apply to every summons and every warrant of arrest issued under the Code. Chapter VII deals with process to compel the production of things. 20. Chapter XVI of the Code deals with commencement of proceedings before Magistrate, Section 204 deals with issue of process in summons case and warrant case. On taking cognizance, Magistrate shall issue summons for the attendance of the accused in summons cases and warrant, or if he thinks fit, summons for causing accused to be brought or to appear before him in a warrant case. Section 205 enables the Magistrate to dispense with personal attendance of the accused. Section 205 deals with special summons in cases of petty offence. We have already referred to Sections 266 (Sessions Case), 238 (warrant case) and 251 (summons case) which require the production or appearance of the accused to enable the Court to proceed with the case. 21. Section 278 of the Code lays down that except as otherwise expressly provided, all evidence taken in the course of the trial or other proceeding shall be taken in the presence of the accused, or, when his personal attendance is dispensed with, in the presence of his pleader. Contrary provision is contained in Section 299. It says that if it is proved that an accused person has absconded and there is no immediate prospect of arresting him, the Court competent to try him or commit him for trial, may, in his absence, examine the witnesses produced on behalf of the prosecution and record their depositions. Such depositions may, on the arrest of the person, be given in evidence against him on the inquiry into, or trial, for the offence with which he is charged. If the deponent's dead or incapable of giving evidence or cannot be found or his presence cannot be procured without an amount of delay, expense or inconvenient which, under the circumstances of the case, would be unreasonable. In the case of an offence punishable with death or imprisonment for life committed by some person or persons unknown, the High Court or the Sessions Judge may direct that the Magistrate of the First Class shall hold an inquiry and examine any witnesses who can give evidence concerning the offence and any depositions so taken may be given in evidence against any person who is subsequently accused of the offence, if the deponent is dead or incapable of giving evidence or beyond the limits of India. This provision is intended only to preserve evidence and does not enable a case to be inquired into or tried or disposed in the absence of the accused. 21A. 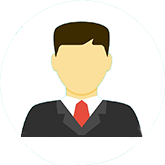 Section 317 provides for inquiries or trial being held in the absence of accused in certain cases. In case Judge is satisfied for recorded reasons that the personal attendance of the accused before the Court is not necessary in the interests of justice or that the accused persistently disturbs the proceedings in Court; the Judge may dispense with his attendance, provided the accused is represented by pleader. 21B. We may in this connection notice Section 315 of the Code, according to which, any accused person shall be a competent witness for the defence and may give evidence in disproof of the charges made against him or any person charged together with him at the same trial. However, he shall not be called as a witness except on his own request and his failure to give evidence shall not be made the subject of any comment by any of the parties or the Court or give rise to any presumption against himself or any person charged together with him at the same trial. Sub-section (2) states, inter alia, that any person against whom proceedings are initiated under Chapter IX may offer himself as a witness in such proceedings. However, there is no provision made that his failure to give evidence shall not be made subject of any comment by any of the parties or the Court or that it shall not be lead to a presumption against him. 22. The above provisions will show that in any inquiry or trial in criminal proceeding except in cases governed by Section 317 of the Code, the inquiry of trial can proceed only in the presence of the accused or where his personal attendance is dispensal with in the preference of his counsel. It therefore became necessary for the Legislature to empower the Court to compel the appearance of accused persons and hence appropriate provisions have been made in Chapter VI of the Code for issue of process to compel appearance. It is duty of the Court to ensure that the accused person is brought before it to enable it to proceed with the inquiry or trial. Provisions in Chapter VI have been devised with that end in view. The accused has no option but to be present either in person, or with the permission of the Court through his pleader. That is why Chapter VI enables the Court, on failure of service of summons, to issue warrant of arrest and affixture of the same further by proclamation and attachment. All these provisions have been incorporated to ensure that the accused is brought before the Court, for, then and then only (barring exceptional cases dealt with in Section 317) a criminal Court can proceed with the inquiry of trial against him. 23. Proceedings under Chapter IX of the Code, however, stand on a different footing. The person against whom claim for maintenance is made is not accused of any offence; nor can he be convicted. The proceedings against him are essentially of a civil nature, since the claim against him is essentially of a civil nature. The Court, naturally, has a duty to inform about the proceedings and of his right to appear and contest. The normal duty of the court it to record evidence in the presence of the person against whom the claim is made. That does not and cannot mean that the Court can compel his appearance. Whether he should appear or not in a matter left to his own decision. A person against whom a claim is made may not desire to contest the case at all. He cannot be compelled to appear in Court and to be present during the recording of the evidence. If he cannot be so compelled, the Court cannot have power to compel his appearance. This is the rationale for the provision in the proviso to Section 126(2) which empowers the Court under certain circumstances to proceed ex parte. The circumstances are where the Court is satisfied that the person against whom the claim for maintenance is made is wilfully avoiding service or wilfully neglecting to attend the Court. Of course, it is not mere avoidance of service or failure to attend the court which attracts the operation of the proviso. Avoidance of service or failure to attend the Court must be wilful, that is; deliberate. Where such a person wilfully avoids service or neglects to attend the Court, the law enables the Magistrate to determine the case ex parte, after recording the evidence in his absence. This would also indicate that the Magistrate cannot compel appearance of such a person in the same manner in which he can compel appearance of an accused person by resorting to provisions relating to summons, warrant of arrest, proclamation and attachment contained in Chapter VI of the Code. 24. Chapter IX of the Code is, as observed by the Supreme Court in Nand Lal's case (supra) a self contained Code. Yet, the Chapter does not contain specific provisions indicating the manner in which the person against whom claim for maintenance is made is to be informed about the claim and his right to appear and contest the claim. Naturally, the criminal Court will have to devise its own procedure in this regard. To this limited extent, no doubt, the criminal Court could look into the provisions in Part A of Chapter VI dealing with summons. But the criminal Court cannot invoke the provisions regarding warrant of arrest, proclamation and attachment contained in Chapter VI. When we indicate that the criminal Court will be guided by the principles in Part A of Chapter VI we do not mean to say that the Court should rigidly follow the same. Such rigid adherence to those provisions would not be practicable and would be counter-productive in a larger number of cases. In a case, as in the present one, where the person against whom claim for maintenance is made is residing abroad, it is not practicable for the court to ensure that summons is served on him by a police officer or by an officer of the Court issuing summons, or even by other public servants. It will not be possible for the Court to cause service to be made under Section 64 on an adult member of his family residing with him for, he would be residing abroad; affixture under Section 64 also may not be possible since he may not have residence within the jurisdiction of the Court or anywhere within India. It may also be impracticable to cause service to be effected under Section 67 through the Magistrate within whose local jurisdiction the person concerned ordinarily resides. We have indicated that the Magistrate, guided by the broad principles contained in Part A of Chapter VI will have to devise ways for service or process. We see no legal difficulty, in the light of these circumstances, in service being effected by registered post or even through a public servant working in Indian Embassy or Consulate in a foreign country. 25. Our attention has been invited to a number of decisions which indicate that provisions of Part A of Chapter VI of the Code are applicable to service in proceedings under Chapter IX of the Code. Some of the decisions indicate that where service is not effected in accordance with those provisions, the Magistrate cannot proceed ex parte. Such a view taken by the Travancore Cochin High Court in C.A. George v. Chacko Joseph, 1953 Ker. LJ 542 has been followed this court in Raghavan Unnithan's case, 1962 Ker LT 526; though the letter decision has been overruled by a Division Bench of this Court in Thankamma's case (supra), this aspect has not been considered therein. Our attention has also been invited to decisions in Gurnam Singh v. Mt. Datto, AIR 1950 East Punjab 20; Revappa v. Gurusanthawwa, AIR 1960 Mys. 198; Thulasingam v. Padmavathi Ammal, 1963(1) Cri. L. 546 (Madras); Hamendra Nath Chowdhury v. Smt. Archana Chowdhury, AIR 1971 Cal. 244; Laxmandas v. Smt. Lachamibai, 1968(9) Guj. LR 116; Dhani Ram v. State, 1974 Cri. LJ 1234 (All) and other decisions to that effect. With great respect, we are unable to agree with the view taken in the above decisions that Part A of Chapter VI of the Code is in terms applicable to proceedings under Chapter IX of the Code. We notice that in none of those decisions was this aspect specially discussed. We do not find any supporting reasons in these decisions. Evidently, in all these decisions the High Courts proceeded on the assumption that Part A of Chapter VI of the Code is applicable to proceedings under Chapter IX of the Code, without examining the question. With great respect, we decline to follow the above view. 26. We have already indicated that Chapter IX of the Code does not specifically indicate that the process to be issued is in the form of summons as contemplated in Chapter VI of the Code. In essence and substance, what the Magistrate should issue is a notice to the person against whom claim is made, informing him that such a claim has been made and that it is open to him to appear in Court and contest the claim. In serving the process, the board principles contained in Part A of Chapter VI of the Code have to be followed. Other recognised ways of effecting service of notice such as to by post also could be followed. We notice that one of us (Bhat, J.) in Chathu v. Gopalan, 1981 Ker. LT 103; indicated that the person against whom maintenance claim has been made and working abroad could be served through a public servant employed in Indian Embassy. The decision proceeded on the assumption that Part A of Chapter VI of the Code is applicable to maintenance proceedings. It was not argued before that Bench that those provisions are not strictly applicable. But on a liberal interpretation Section 65 of the Code, this Court indicated that the second part of Section 65 could be utilised by Court for service in contingencies where the person sought to be summoned is actually working abroad. The Court also noticed that Section 65 conferred power on the Magistrate to order fresh notice in such manner as he considers proper and read into this provision a very wide discretion of very broad import. We agree that the liberal interpretation given to the provision is warranted but we are of opinion that strict application of Part A of Chapter VI itself is not called for in such cases. We therefore hold that service in regard to proceedings under Chapter IX is not to be effected strictly in terms of the provisions in Part A Chapter VI of the Code, though the broad principles of the latter chapter could be invoked and service by registered post and through an officer of the Indian Embassy abroad would also be valid service. Where service is effected by the registered post or through an Indian Embassy abroad, that would be sufficient service. Such service cannot be challenged on the ground that service has not been attempted in terms of the provisions of Part A of Chapter VI of the Code. 27. Where such service has been attempted and the person concerned wilfully avoids survive and again where such service has been effected and the person concerned wilfully neglects to attend the court, the Magistrate is competent to determine the case ex parte in accordance with the provisions in the proviso to Section 126(2) of the Code. 28. A person against whom such an ex parte order has been passed has the right to file an application before the Magistrate to set aside the ex parte order, provided the application is filed within a period of three months from the date of the order. Even if there is delay in filing the application, it is open to him to invoke Section 5 of the Limitation Act. We are not in this case concerned with the question whether "three months from the date thereof shall be interpreted to mean "three months from the date of knowledge of the order". That question does not arise in this case. At the same time, remedy of the person who suffers an ex parte order is not confined to filing an application to set aside the ex parte order before the Magistrate concerned. It is open to him to challenge the order by way of revision before the revisional Court in terms of Section 397 of the Code. Of course, the scrutiny by the revisional Court will be of a more limited nature than that the scrutiny the Magistrate himself has to make in an application to set aside the ex parte order. Learned counsel for the petitioner indicated that the learned Sessions Judge in this case took the view that no revision would lie. We do not understand the learned Sessions Judge to have expressed any such view. The view taken by him was that the order is not vitiated on any of the grounds on which he could interfere in revision. 29. We have already indicated that the decision in Raghavan Unnithan's case (supra) has been overruled by a Division Bench of this Court in Thankamma's case (supra). A learned Single Judge of this Court in Sumathi's case (supra), followed the view taken in Raghavan Unnithan's case, since, evidently, Thankamma's case was not brought to the notice of the learned Judge. One of the aspects considered in those decisions was whether the bar of three months would apply in the case of an ex parte order passed without complying with the proviso. It is unnecessary for us to consider this question in the case. So far as this Court is concerned, the view taken by the Division Bench has to prevail till it is overruled by a larger Bench. However, we would like to indicate that we agree with the Division Bench that it is not the issue or summons that confers jurisdiction on Courts or persons. In that decision there was an observation that unless the order passed by the Magistrate ex parte is set aside, the said decision is valid and binding. We do not understand this to mean that the ex parte order cannot be challenged in revision. Revisional jurisdiction is a limited jurisdiction and not the same as appellate jurisdiction. When the Division Bench in Thankamma's case observed that as long as Magistrate has not set aside the ex parte order, that decision is valid and binding, it appears to us, the Bench only meant that it is valid and binding in so far as the Magistrate's Court is concerned. The Magistrate cannot go behind it. Nor can the parties seek to go behind it in that Court. The decision does not lay down that ex parte order cannot be interfered with by the revisional Court. 30. Learned counsel for the petitioner explained that on two occasions notices were sent to his client by registered post but the notices were not returned before the dates of posting and on the third occasion the learned Magistrate directed issue of notice or summons through the Indian Embassy in Saudi Arabia and that notice was served on the petitioner. We have indicated that service of notice by this method has to be taken to be valid. Admittedly petitioner did not appear either in person or through counsel before the Court and the learned Magistrate proceeded to determine the case ex parte. Of course, he did not record a specific finding that the petitioner herein was either wilfully avoiding service or wilfully neglecting to attend the Court. We have indicated that the mere fact that there is no specific finding recorded in the order or the mere failure to state reasons in the order would not vitiate the order. The revisional Court has to examine the record to see whether in fact the Magistrate was so satisfied. 31. Petitioner has no case that his address given in the maintenance application is wrong . We find from the application that it gives his native address and the address abroad. Notices were admittedly sent to the foreign address . Petitioner owns up that address inasmuch as he himself gave the same address in the application filed by him and in his revision petition. The first two notices were not served on him though they were sent to the correct address . The third notice (sent through the Indian Embassy abroad) was admittedly served on him. There are sufficient materials to show that he was wilfully avoiding service on two occasions. 32. Learned counsel for the petitioner contended that the petitioner who was abroad had no time to make arrangement to come over to India to be present in Court or to engage counsel. According to him, the petitioner actually sent vakalath to a lawyer in the locality but the vakalath reached the lawyer only on 5.11.1983 and since the vakalath was defective, it had to be returned. Therefore, it is contended that petitioner did not wilfully neglect to attend the Court. We have perused the records made available to us. In the criminal revision petition filed before the Sessions Court, the petitioner stated that he came to know of the proceedings on 4.10.1983 and the advocate received the vakalath on 5.11.1983. But order was passed ex parte on 1.11.1983. Since the vakalath was not property executed, it was sent back to him. Petitioner was intending to come over to India on leave. He sent a fresh vakalath to the advocate and he filed the vakalath only on 3.4.1984 with a view to get certified copy. In the Crl. M.C. filed in this Court, the contention is that petitioner received only in November 1983. Evidently, this contradicts his statement before the Sessions Court that he came to know of the proceedings on 4.10.1983. He had sufficient time to make arrangements to have counsel represent him in Court. He has no case that he immediately took prompt steps and on account of postal delay the vakalath reached the lawyer late. Of course, these materials were not before the learned Magistrate. Records before the learned Magistrate only indicated that notices sent twice were not returned and the notice sent on the third occasion was served but the present petitioner did not appear before him either in person or through counsel. We are of opinion that these circumstances were sufficient to satisfy the learned Magistrate that the petitioner herein was wilfully neglecting to attend the Court. The records also indicate that the learned Magistrate was so satisfied. We are not satisfied that there is any ground to interfere under Section 482 of the Code. Crl. M.C. is dismissed.